Up until version 2.4, the Moneris gateway that our plugin extends didn’t allow to change the hosted tokenization profile ID on the fly. Due to that, if the tokenization feature was enabled, the same profile ID was used for transactions in both USD and CAD, causing the payment to fail for one of the currencies. Version 2.5 of the Moneris gateway was made more flexible from this perspective, and it’s now possible to enter two separate tokenization IDs for US and Canadian Dollars. Handled condition when the Moneris gateway doesn’t pass an order with the filter. This is an edge condition, but it can happen in some circumstances, causing the payment to fail. The improved error checking will handle such condition gracefully, allowing payments to complete successfully. Improved country detection and selector widget. The plugin can now detect customer’s county/province/state automatically, thus giving a more accurate geolocation. The widget has been updated as well to take advantage of this new option, and it allows customers to select their country and county/province/state. The widget automatically updates the list of provinces when the country changes. 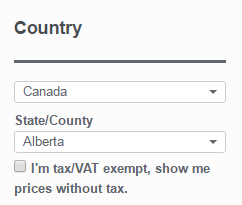 The new selector widget in the Tax Display by Country plugin allows to select the country and county, province or state quickly and easily. Fixed conflict with shipping calculator. The shipping country is no longer overwritten when customer uses the shipping calculator. Fixed bug in tax calculation on cart page. The bug caused the “fixed prices” feature to be ignored when the shipping calculator updated the shipping costs. Removed notice message, related to an incorrect reference to customer’s location attribute. Compatibility with WooCommerce 2.6. Added support for the new shipping logic. Leveraged new woocommerce_shipping_zone_shipping_methods filter to ensure that shipping methods’ parameters are loaded in the correct currency. Fixed bug in CloudFlare geolocation. In some cases, CloudFlare geolocation can incorrectly pass a lowercase country code. This can prevent the Currency Switcher, and several other plugins, from detecting visitor’s location correctly, as they expect an ISO ALPHA-2 code, which is uppercase. We added a patch to add this condition gracefully. Fixed bug with minicart and “force currency by country” feature. The bug prevented the minicart from updating automatically when the “force currency by country” option was selected and the customer changed country using the selector widget. Fixed bug in handling of coupons’ minimum and maximum prices. The bug prevented the limits from being converted properly, in some circumstances. 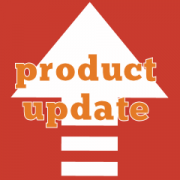 Improved WooCommerce version detection in reporting manager class. The class now uses a different logic to find out which reports to use, and returns more information if an unsupported version is found.